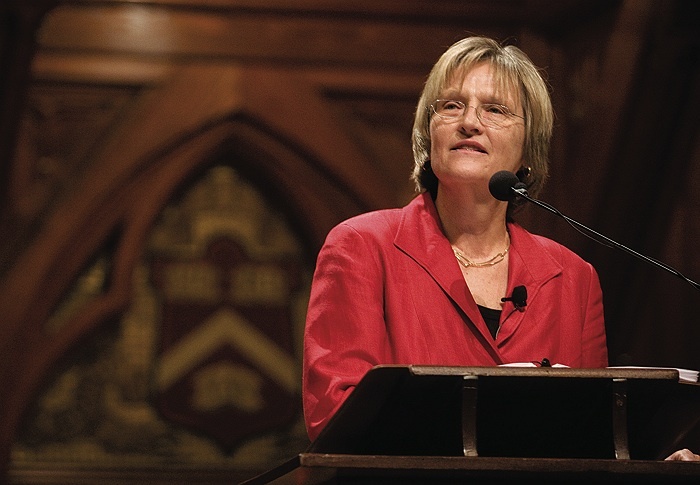 Following what she called an “unusually challenging year” dominated by financial reversals, President Drew Faust delivered an “opening-of-year” address in Sanders Theatre on September 24, in lieu of the e-mail messages sent in prior years. It seemed “a good moment to talk in person,” she told the audience. Turning to current circumstances, Faust noted that the endowment’s value had declined sharply (see “$11 Billion Less,” page 50). Given typical distributions of about 5 percent of the assets’ value annually, she noted that the decline would imply a loss of $500 million in such income—devastating for a University that derives more than a third of its operating revenue from that source. Instead, Harvard aims to spend about 6 percent this year, and then a progressively lessening percentage in future years, to keep the decline in operating revenues from being too abrupt or jarring. Nonetheless, that means that after a period of rapid growth, the University now faces a structural revenue gap, Faust said—because it tied income too closely to volatile markets and learned “costly lessons about risk” as a result. Looking ahead (and outlining some of the information to be disclosed in Harvard’s annual financial report in October), Faust said that net income from tuition (after financial aid) declined in fiscal year 2009; that current-use giving had risen, but that gift income overall, as reported, had declined by nearly 10 percent; and that sponsored-research funding had risen by a relatively robust 7 percent. The latter boost may not be permanent, she warned, given the two-year surge of funding associated with the federal government’s stimulus program. How would Harvard adapt? Faust reiterated principal elements in the financial plan (see “Finding a New Footing,” September-October, page 44): distributions from the endowment will decline 8 percent in the current fiscal year, and “at least” that much more next year. She said that the schools’ responses to new budgetary realities varied with their circumstances, but did not provide any detailed examples. Spending reductions did achieve “meaningful savings” last year, compared to the budget adopted before the financial crisis. Many reductions reflect multiple steps taken to restrain personnel costs: trims in hiring and in filling vacancies; some voluntary retirement incentives for staff, followed by layoffs late last spring; and the freeze on faculty and nonunion staff salaries. The University has also “slowed our ambitious capital plans,” she noted, especially with regard to the long-term ambitions in Allston. Compared to last year’s original capital plan, spending has been cut in half for the next several years, she said. And efforts continue to secure efficiencies in procurement. For the future, Faust said, Harvard must identify and protect its core priorities—“what we’re here for,” namely “education and research of the very highest caliber.” It will not be possible to pursue every interesting idea, nor do everything done heretofore. The community, she said, would have to move promptly to a “new normal” state of affairs, because it was unlikely that rebounding financial markets would restore the endowment anytime soon. Accordingly, everyone at the University would have to “embrace the opportunity, and the necessity” of working more efficiently and cooperatively, doing better work by harnessing “the power of a more unified Harvard.” She invoked President Charles William Eliot, who in 1908 (his fortieth and last academic year in office) called for a “more collaborative, more integrated” University. At the same time, Faust underscored Harvard’s commitment to attracting and supporting the best faculty members and students from around the world, a basic principle of both meritocracy and of access. She listed areas of intellectual connection across schools—ranging from the global economy and stem-cell science to work on human rights—and expressed hope that students and faculty members would increasingly feel themselves part not only of a single school, but of the University. She reiterated the commitment to liberal arts as a fundamental purpose of a Harvard education. And she encouraged members of the community to recognize their obligation to “live by the ethical standards we teach” and to “repay the privilege of being in a rare place like this” through lives of service. Faust then sketched examples of the kinds of collaborations she encourages, both administrative and academic. She cited the task force examining the “curious practices” of Harvard’s 70-plus libraries, whose separate operations may impede access to collections and produce duplication, unaffordable expense, and sub-optimal teaching and research. Separate information-technology systems around the University, she added, likewise impede compatibility and collaboration, and drive up costs. Though a “start of year” address may appropriately skip details, very hard tasks still loom before the University; it will take effort and good will to keep everyone pulling together. Among Harvard units, FAS remains particularly stressed fiscally (see “FAS's Progress--and Prognosis”). As major assumptions about campus development in Allston are comprehensively revised—the most sweeping visions included relocating entire schools and building vast new laboratories—there will be significant issues to explore, including the nature of collaborations with prospective partners (nonprofit or commercial) and conceiving a feasible new financial strategy. In the meantime, Harvard must weigh renovation of those schools’ existing facilities, even as it adjusts community-planning efforts with residents of Allston. Internally, should Harvard’s myriad information systems be melded, outsourced, or reconfigured in other ways? And so on.